I swatched the Lavold Silky Wool (color 25 which isn't quite as dark as this picture would lead you to believe) last night. It was spot on the first try with US4. 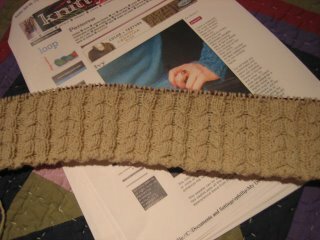 I cast on for the S size and got through the first 3 repeats before calling it a night. This is where I am now. 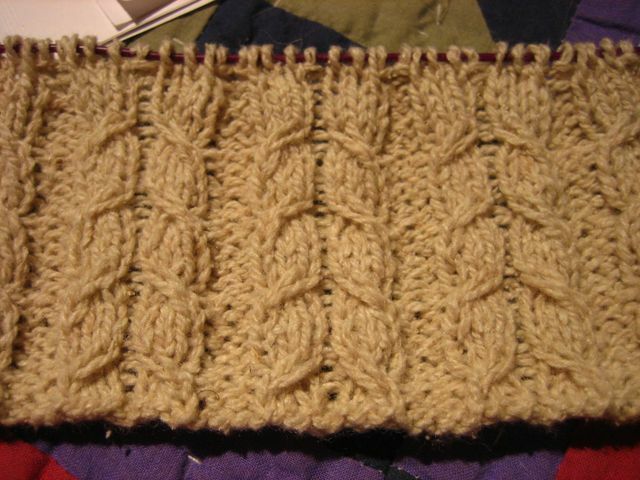 I didn't get much knitting time today, had lots of things to do at home, but have done the first decrease. Wonderful start to Ivy!! Beautiful! Hey I just wanted to let you know that I used to Silky Wool for a garment about a year ago. Its great stuff, but my experience is that it will relx and stretch some as you wash it. I'm guessing my sweater has grown a size. I do like how the cables pop out on your swatch! 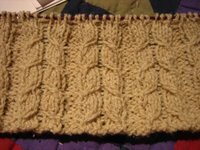 I am relatively new knitter - well I am feeling very new with this project - and I am having trouble with the twisty cable part. When you slip a stitch with the yarn held to the front or back, do you slip knit-wise or purl-wise? I've tried both and rather than figuring it out, now I am more confused. Please help!